Yesterday we spent the morning on a private snorkel tour from our beach here in Ocotal in Costa Rica. We had a very enjoyable time on what was a really good value tour ($65 per person), and even though we didn’t see a lot of sea life, we did see a variety. The water was bit murky but we saw a dozen or more varieties of fish, one eel, one sea snake, a puffer fish, starfish and lots of interesting sea anemones. From the boat we also saw hundreds of “flying” devil rays, several dolphins and a turtle. It was a lot of fun. wonderful opportunities in our travels. Sand Island Maldives – My favorite snorkeling day ever was our morning on the tiny (50×75 yards) sand island about an hour boat ride from the island of Huraa in the Maldives. Known for the spectacular crystal clear blue water, the Maldives are a divers paradise. Our snorkeling day rewarded us with a vast collection of sea life, but the more amazing part of this day was the stunningly beautiful coral reef. I’ve never witnessed anything like it before or since. Great Barrier Reef Australia – Memorable, iconic and expensive, our day on the Great Barrier Reef out of Cairns was fun. An overcast day made for some murky water and rough seas but we enjoyed this once-in-a-lifetime experience with a nice selection of interesting coral and fish including the resident Maori Wrasse named Wally (see photo). Read more about it here. Galapagos Ecuador – Everything about the Galapagos Islands is unique and memorable – both on land and in the sea. One of our favorite trips of all time. 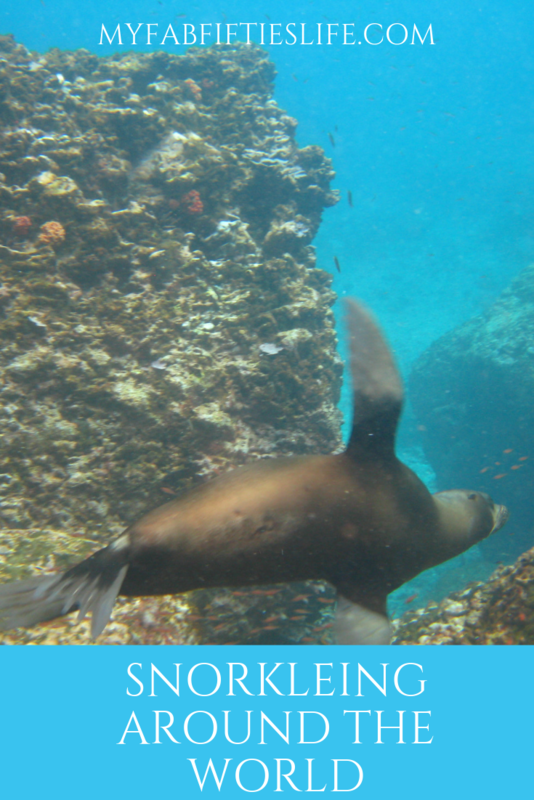 The day we snorkled in the Galapagos was the only time I have ever swam with seals who danced a playful ballet around us as we swam. We also encountered baby seals, beautiful turtles and small sharks. Just one remarkable event in a very remarkable place. Zanzibar – possibly my worst sunburn in my life occurred the day I snorkeled with my sister in Zanzibar. My sister’s first time snorkeling and in our excitement we both forgot to lube up. The waters off of Zanzibar are incredibly beautiful, but we actually didn’t see that many fish. As memorable as the sunburn was the rickety Dhow boat (traditional Zanzibar wooden fishing boat) that took us off the beach out to the snorkel area. Molokini (Maui) – our favorite island is Maui and when in Maui snorkeling at Molokini is a highlight. Depending on the time of day you go, it can be pretty crowded but you will see such a great variety of colorful tropical fish it’s worth it. And if you can, book a tour that also goes to Turtle Island so you can see these magnificent creatures. Captain Cook (Big Island) – We have snorkeled in the Captain Cook bay on the Big Island twice. Once we came on a tour boat and once we did the steep hike down (and eventually back up) to the bay. The bay doesn’t have much coral but lots and lots of beautiful fish make the bay their home. Kona Manta Ray Snorkeling (Big Island)– one of the funnest, most breathtaking and most amazing things I have ever done was the nighttime snorkel in Kona to swim with the amazing and giant (up to 20 feet wingspan) Manta Rays. These gentle giants are graceful and harmless and truly spectacular. Read more about it here. just off the beach. We encountered a solo turtle which let us swim and follow him for more than half an hour. Just me, my son and this beautiful creature. I’ll never forget it. Koh Phi Phi Thailand – very crowded and somewhat overrated was our snorkel tour adventure to Koh Phi Phi in Thailand. Although the beautiful blue water is warm and fun to swim in, we didn’t see much of a variety of fish and there were so many tour boats there it was ridiculous. We did enjoy the water though and most of all having fun with our adult sons in the gorgeous tropical Thailand waters. I hope you too will have the chance to visit one or more of these beautiful and amazing snorkeling places. I have no doubt you will remember it forever. Note – double click on any photo in this blog for a larger version! Please share this post! You can pin it direct from the photo below. I am a 59 year old retired Grey Goddess on the Go! Traveling the world with my husband of 36 years. We travel, we eat, we hike, we bike, we read, we write and we have grand adventures in our Fabulous Fifties! Book Review every Wednesday and travel blogs most Fridays and Sundays. Join our club and be fabulous too! © 2016 Laureen Lund. All photos © Laureen Lund unless otherwise noted. All Rights Reserved.